We are proud to announce that ISD is organizing a major community garage sale on Sunday May 21, from 10am to 12am. The event will take place on school campus, you are welcome to invite your spouses, children, friends and family members to join. The Animal Rescue League is glad to have a stand on that date, where we will be selling all sorts of items: clothes, video games, game boards, electronics, music instruments, DVDs, Toys, Books, Comic Books, Art supplies, and other useful stuff! We highly encourage you to come and buy all of our nice stuff! All funds will go to our local vaccination programs in Dakar. We also hope some of you will have donations to give us. We accept anything as long as it is in good shape. Please drop off donations in room 104 (Mme Idir). Thank you in advance for helping us in this process, may it be through your support, donations or even encouragements! P.S. : Feel free to donate items that we can sell at the yard sale, this would be really helpful! Interact collects 150 school kits !! On Friday, November 11, 2016, the High School Interact group made 150 school kits. They came after school and put them together with the materials that were provided for them (bags, pencils, erasers, pens, etc.) 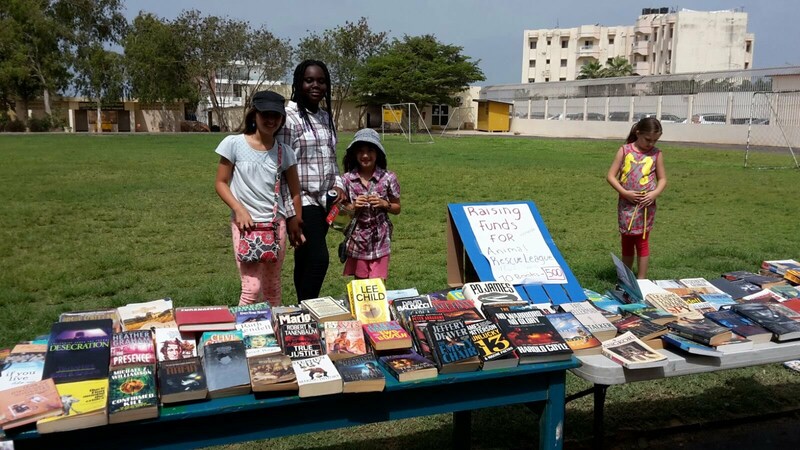 by the Rotary Club Dakar Almadies. They soon will be donating these kits to a school called Philip Senghor de Ouakam on Thursday, November 17th at 6pm. SO WHAT IS INTERACT ? Interacts are clubs for young people aged 12-18 who want to join together to tackle issues in their community that they care most about. They are sponsored by individual Rotary Clubs which provide support and guidance, but they are self-governing. Rotary International is a global association of Rotary Clubs with more than 1.2 million members worldwide. Rotarians are united by common values and vision for the future as they sharpen their focus with targeted specific causes that will reach communities most in need. Every Interact club carries out at least two service projects a year: one that helps their school or community and one that promotes international understanding and goodwill. 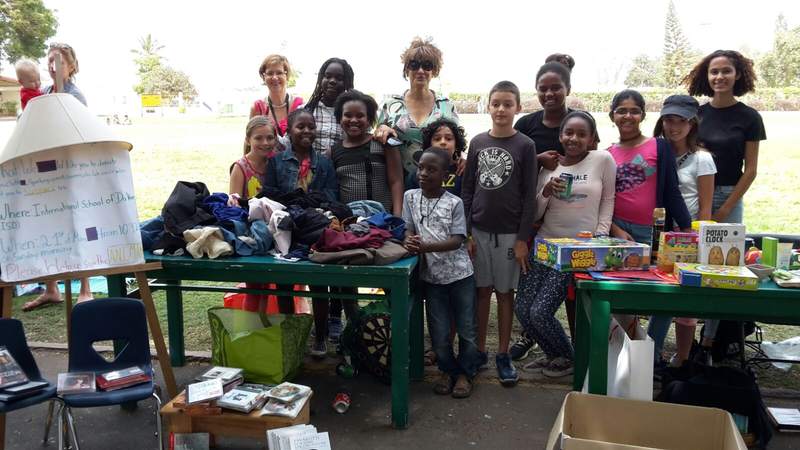 ISD Interact Club meets at least twice a month and is sponsored by the Rotary club Dakar Almadies. WHAT CAN STUDENT GET FROM THIS ACTIVITY? · Interact can really boost college application (Being part of an Interact Club may be very impressive on University applications and can make a real difference). Be part of the change ! 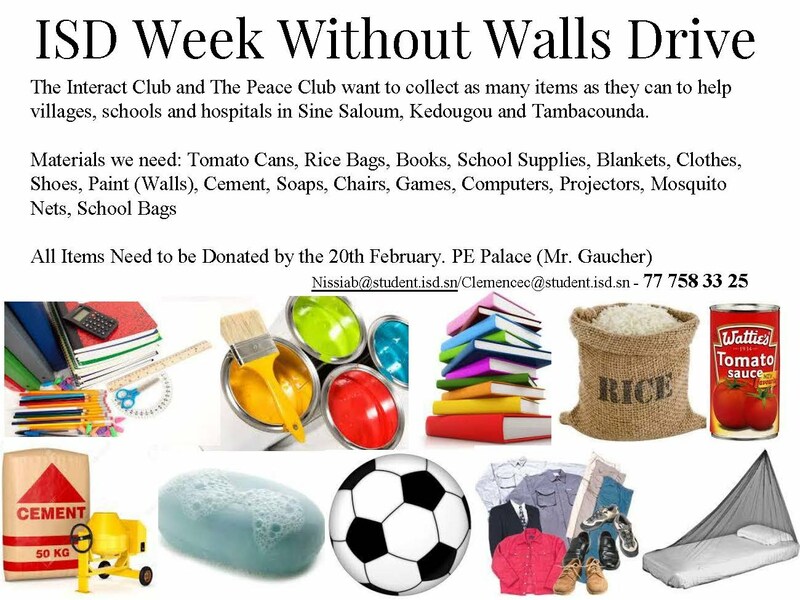 Our next Interact Club project is the Week Without Walls Drive, where we will be working in collaboration with the Peace Club to gather as many items as we can to then donate to the villages/schools we will be visiting during that week (February 22nd to the 26th). Bring your donations to M. Gaucher at the PE Palace. Please make sure that donated items are in good condition. They will be transported by the school buses taking students on the WWW trips. Hoping to have many donations! Animal Rescue League is starting again this 3rd Trimester at ISD. Nissia and Cosette (9th grade students) will be taking care of Elementary Students; they will teach them the importance of animals and the environment through fun activities, games and projects. A few weeks ago, our club was contacted by a member of the Dakar Women's Group, telling us about a new Environmental Awareness Project. We were invited to participate in it and we decided to do our project on "Marine Pollution in Dakar". This was originally a poster that was supposed to sensitize your community; we thought about ISD or even a local Senegalese Sister School. These past two weeks our group of awesome 14 students drew a beautiful and very colorful scenario of a kid wanting Dakar's oceans to be cleaner. Another team was on the other hand, assigned the cardboard construction (painting, recycling and pasting). In only two classes we had created a magnificent piece of ART. Here are some pictures, and you can surely be proud of the kids who helped us! Thanks to Mme. Idir and Mme. Bocaccini for supervising the activity. 2015 is going to be "THE" year for ARL. A fresh new start for a fresh new program. Cosette and Nissia (Grade 9) are in charge of the ARL After School Activity for this year's 2nd trimester. The kids will participate in various activities that will raise their awareness on animals and the environment. We have many awesome projects that we are still figuring out with our 10 Super ARL Kids! Possible Ideas: Field Trips to Bandia, Visit a Vet's office, do a beach clean-up, etc.. Here is our program (click HERE); feel free to check-it out! Hello teachers, parents and students! Welcome again to the fresh 2014/2015 ISD school year. I hope most of you are all excited about that! This year, ARL has numerous goals to accomplish and, this is why we're waiting for YOU to join our team! Animal Rescue League will be having an after school activity during trimesters 2 and 3 in room 306 (Mme Idir's class). ARL will be in charge of informing students about animals, their importance in our ecosystem and, why it is crucial that we protect them. The students will also learn about the environment, and why we should preserve nature's beauties. Field trips, fundraisers and fun plays are getting set up for this activity. We are planning to vaccinate ISD's feral cats. This action will take place either next weekend, or the weekend after. Don't forget that the ARL team accepts anyone to join its growing, animal-friendly group. To join or make a donation, please contact us using one of the email addresses below. ll and loves playing with her brother Musky that lives down the road. housekeeper and guards. Our boys play with her constantly so Lulu has learned how to be gentle with children. She is definitely an outside dog, though she doesn't mind coming in and laying on the carpets. We need to find a suitable family that will love and welcome Lulu into their home. We are unable to take her to our next post in Geneva.